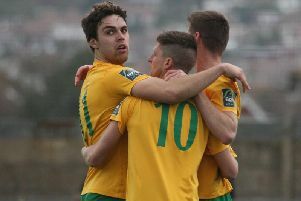 Horsham manager Dominic Di Paola believes being without the injured Charlie Harris means they are missing 'one of the best' players in the league. The former Brighton & Hove Albion youngster and Eastbourne Borough midfielder was ruled out for the season back in February with MCL and cartilage damage. The club and supporters rallied round to help fund a private operation to cut the waiting down, but he will still be sidelined until pre-season. The central player, who joined Horsham permanently in the summer after a loan spell last season, had been a stand-out performer this season. And while quick to recognise the talents of his other players, Di Paola admitted that Harris is a player any team would miss. Following their 0-0 draw with fellow play-off chasers Ashford Town on Saturday, the Horsham boss said: "We are crying out for Charlie Harris to be honest. When we play the top teams you just see you are missing that players. It is such a loss for us. "For me he is one of the best in the league and not to have him in these games is when you notice it. He controls the tempo of the game and we have not got that player. "We have lots of other talents and lots of good players, but we haven't got that player that controls the tempo for us and we always look a better team when he players. "The other boys have done brilliant, but it putting square pegs in round holes a little bit, so it is always hard, but we aren't going to be able to bring in anyone. The boys we have got are good in their own right and deserve to be playing."